At some point, after running your PBX for a while, you will get some exposition. If you go to your PBX console and watch your logs, you may notice that sometimes someone tries to register or to send an INVITE signal. 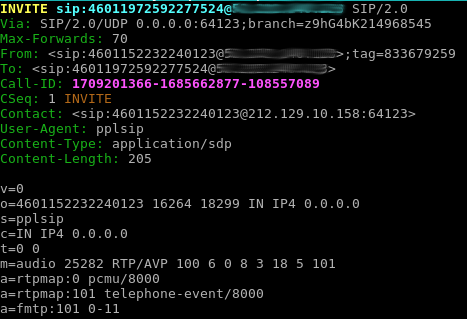 These tries are usually done by scripts looking for misconfigured SIP servers. After looking on the Internet, I got a little list of User-Agent identifiers for those scripts. So, I wrote the following script in order to help everyone to create the rules. The anti-script script will inject basic and configurable IPTables rules that will prevent a connection from kiddy script to your PBX. Please note that the User-Agent script is very easy to change. Most seasoned hackers will be able to change it, however, the newbies will not. This approach only makes it more difficult. By default, the script will create rules for the ports 5060 and 5080, both UDP and TCP. INVITE, From, To, and Contact must use a fully qualified domain name instead of IP's. I am pretty sure there are more criteria. When the time comes, I will write about that.